Rhizopon AA #1 . Rhizopon AA #2 . Rhizopon AA #3 . Growers want to produce new plants which are exactly like the mother plants that are found in the home, garden, nursery or greenhouse. To produce a plant which is genetically identical to the mother plant clonal (vegetative ) propagation is needed. Propagation by the rooting of cuttings (adventitious root formation), root cuttings and division, stooling, layering, grafting and budding, and similar techniques can produce the desired clonal results. The selection of the method is dependant upon the plant variety. Propagation from seed while suitable for many plants, especially annual plants, often produce variable results. In-vitro propagation, a relatively new technique, requires specialized equipment and many times does not produce new plants as expected. Plants propagated from cuttings have the same characteristics as the parent plant. The rapid generation of new adventitious roots is necessary for the plant to transport water and essential nutrients from the media. Rhizopon AA #1, #2 and #3, Rhizopon AA Water Soluble Tablets and Hortus IBA Water Soluble Salts rooting hormone treatment helps the plant to rapidly develop new roots when propagating from cuttings. The most attractive plant is a symmetric plant. Using Rhizopon AA #1, #2 and #3, Rhizopon AA Water Soluble Tablets and Hortus IBA Water Soluble Salts root stimulation takes place all around the basal end of the cuttings. 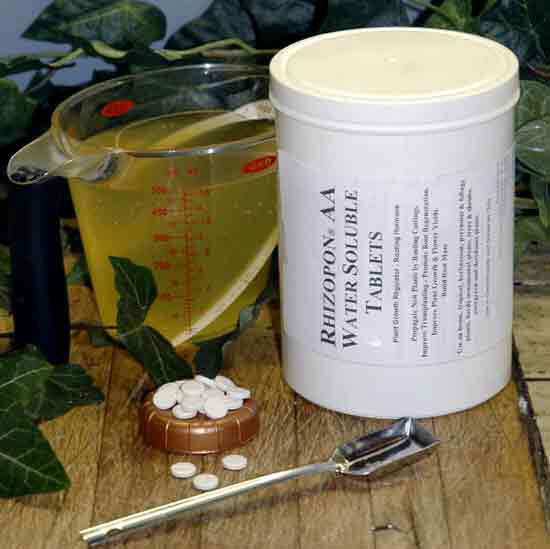 Rhizopon AA and Hortus IBA Water Soluble Salts products have unique formulas which induce uniform absorption of the active ingredients. After early and symmetric root formation the plant stands solid in the soil, it absorbs water and nutrients, develops uniform shoot, stem and leaf growth and superior total growth. 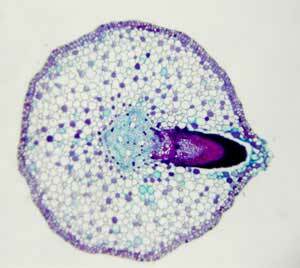 In the 1930's Dutch scientists unlocked Nature's Secret to plant growth regulation of roots. They developed products and techniques that promote rooting of cuttings and increased root mass. Today the manufacturer, Rhizopon b.v. is the world's largest and oldest company solely devoted to rooting products and technology. Rhizopon and Hortus USA do plant research at their facilities in New York City, Hazerswoude, Holland, and leading research facilities including the University of Arkansas USA and the Dr. W. Kruipt Institute, Hekendorp Holland. In the 1980's Hortus USA Corp., a US company, became the exclusive importer of Rhizopon AA #1, #2 and #3, Rhizopon AA Water Soluble Tablet plant rooting products. 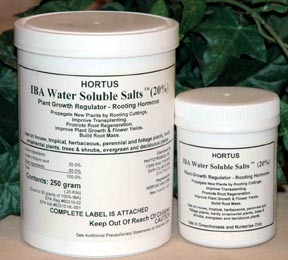 Later, adding to the product line, Hortus USA developed Hortus IBA Water Soluble Salts to allow important growers to use high water soluble concentrations of the active ingredients. 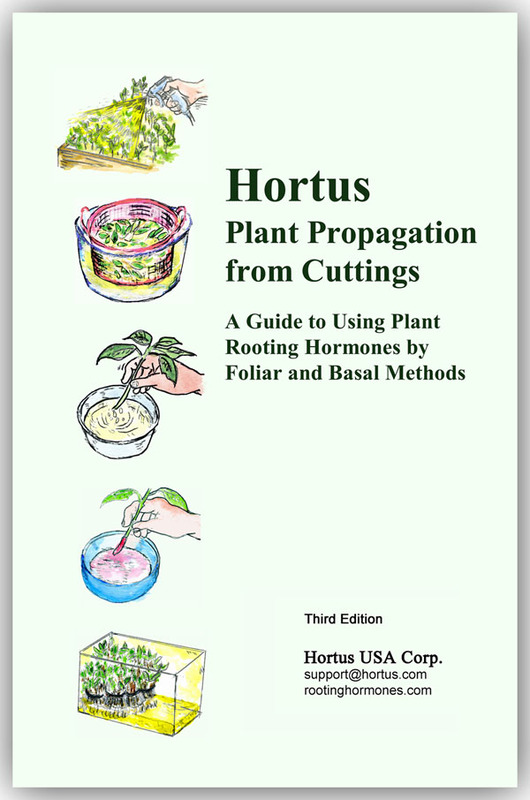 Hortus USA has registered all products with the US EPA. 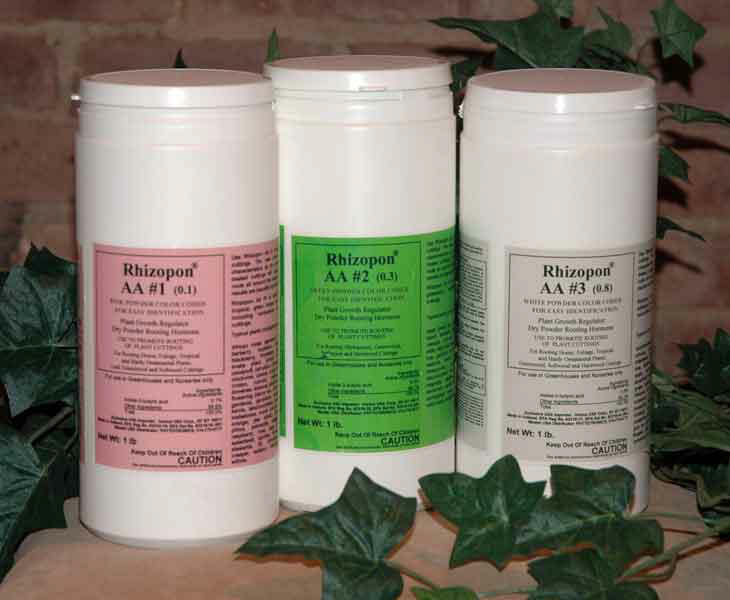 When you treat many different types of cuttings that require different hormone concentrations use Rhizopon AA #1, #2 and #3 dry powers, You can switch easily from one concentration to another. When treating many small production lots Rhizopon AA #1, #2 and #3 dry powders do not need special preparation. They are ready to use. You control the solution. You make Rhizopon AA Water Soluble Tablet and Hortus IBA Water Soluble Salts fresh solutions for any use. You make Rhizopon AA Water Soluble Tablet and Hortus IBA Water Soluble Salts solutions from very dilute to extremely concentrated. Use Rhizopon AA Water Soluble Tablet and Hortus IBA Water Soluble Salts solutions when treating many cuttings, such as chrysanthemums, fuchsia and geranium, by Total Immerse. Totally cover the cuttings with solution in a basket then plant. You can also treat the cuttings using Spray Drip Down®. First plant the cuttings then spray the solution onto the cuttings until there is drip down. You can also quick dip the basal end of the cuttings in the solution then plant. The time of the year may change the method and concentration. Cuttings of the same plant variety may root better using Rhizopon AA #1, #2 and #3 powders or Rhizopon AA Water Soluble Tablets and Hortus IBA Water Soluble Salts liquid. For example, greenwood cuttings may root better with solution treatment. Later in the growing season more woody cuttings from the same plant may root better with powder treatment. 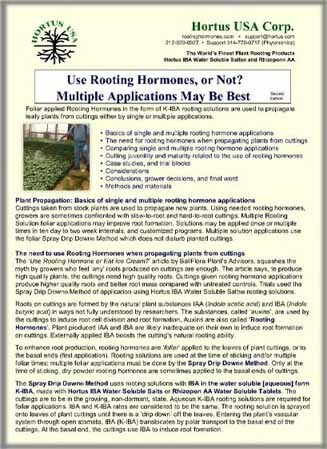 For adventitious rooting, all plants need plant growth regulator rooting hormones in order to produce roots on cuttings. To some extent these regulators are produced by the plant itself. Cuttings from different plant varieties and species have different ability to root. 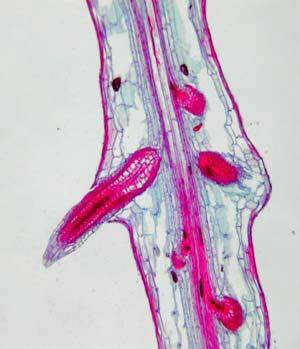 Some cuttings root easily, some are difficult to root, and some plants can not produce roots from cuttings. Rhizopon AA #1, #2 and #3, Rhizopon AA Water Soluble Tablets and Hortus IBA Water Soluble Salts rooting hormones act with the plants own natural rooting regulators to aid root formation. The concentration of the induced regulator hormone should be adequate to induce root development and below the threshold to inhibit growth. Successful root formation helps the cutting to take up water and nutrient substances faster. Take cuttings at the proper time from carefully selected stock plants. Use a successful rooting method with the optimum concentration of Rhizopon AA #1, #2 and #3, Rhizopon AA Water Soluble Tablets and Hortus IBA Water Soluble Salts rooting hormones. Use the lowest concentration of Rhizopon AA or Hortus IBA Water Soluble Salts to do the job. Take care of the cuttings. 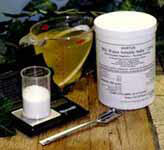 Make your own fresh solutions: measure the Salts and mix in ordinary water. US EPA Registered. Used by famous professional growers. Replaces tech IBA and K-IBA & costly alcohol premixes. You make fresh rooting solutions. Alcohol free. Dissolve in ordinary water. Always fresh. Spray Drip Down® method: first stick cuttings in media then spray with solution until drip down. Total Immerse method: totally immerse the cuttings in the solution a few seconds then stick in media. Quick Dip method: dip the basal end of the cutting into solution a few seconds then stick in media. Soak Immerse method: dip the basal end of the cutting into solution a few hours then stick in media. Make your own fresh solutions: count the Tablets and mix in ordinary water. US EPA Registered. Used by famous professional growers. Replaces tech IBA and K-IBA & costly alcohol premixes. You make fresh rooting solutions. Alcohol free. Dissolve in ordinary water. Always fresh. Dry powder rooting hormones. Alcohol free. Always fresh. Available in 1 pound and 25 pound kilo sizes (full pounds not half pounds). Reasons to use rooting hormones- Use Rooting Hormone or Eat Ice Cream? by Ball FloraPlant technical support. Use Rooting Solutions, or Not? Order Rhizopon AA #1, #2 and #3, Rhizopon AA Water Soluble Tablets and Hortus IBA Water Soluble Salts from your favorite horticultural supplier. FRED C. GLOECKNER AND CO.
BUY NOW - LOW WEB PRICES! Rhizopon AA #1 . Rhizopon AA #2 . BUY NOW! Tell them you were referred by this link for special pricing.